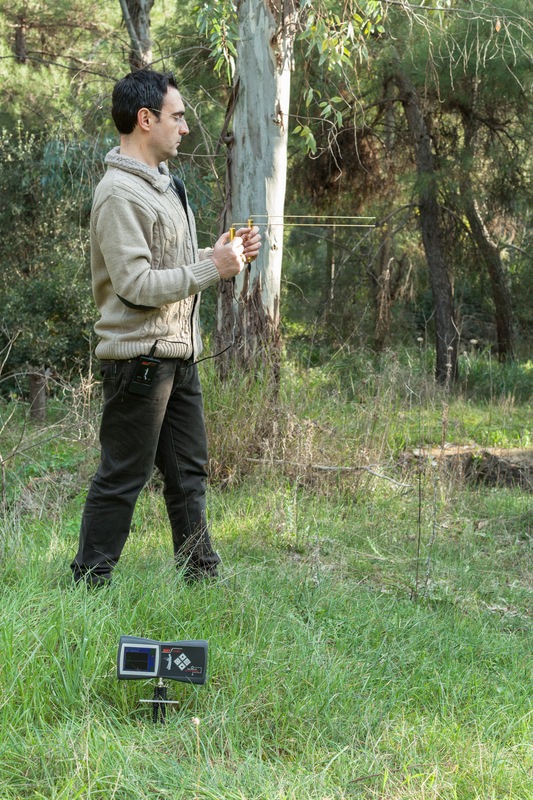 With Rayfinder Gold Detector Long Range Locator the user has the ability to define detection range, for example the range can be set between 300 to 2100 meters. 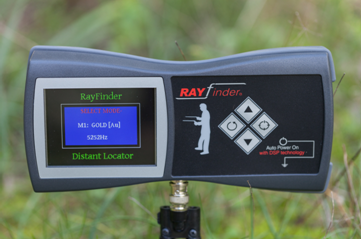 This Rayfinder gold detector feature, Is useful to estimate the distance to target. 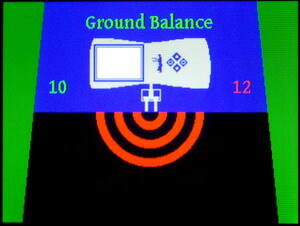 Also when limiting the locator range, smaller targets are rejected and great accuracy in centering is achieved. 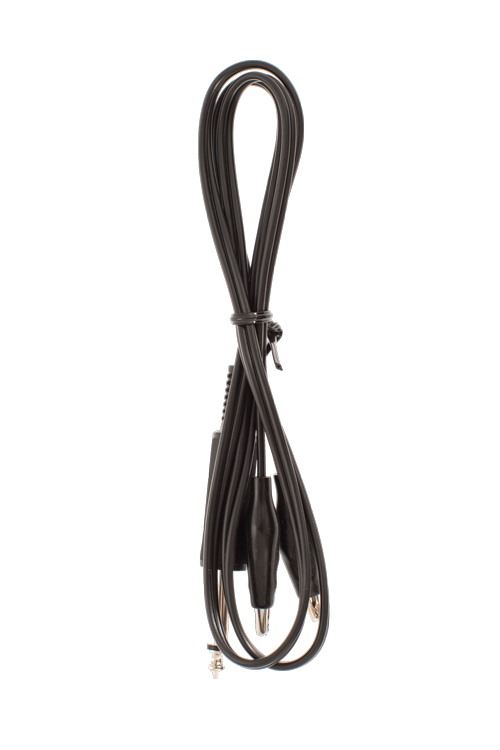 RAYFINDER signal power for long distance location: Powerful 24 volts peak-to-peak transmitter, permits to set detection range levels from 300 m. and up to 2100+ m.
RAYFINDER signal accuracy: The most stable frequency signal possible. 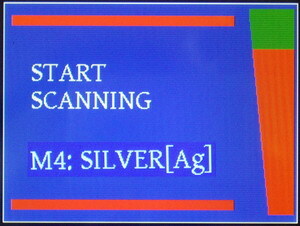 Scan gold and precious metals with frequency accurate down to 0.1 Hz. Find treasure and ignore the trash!. 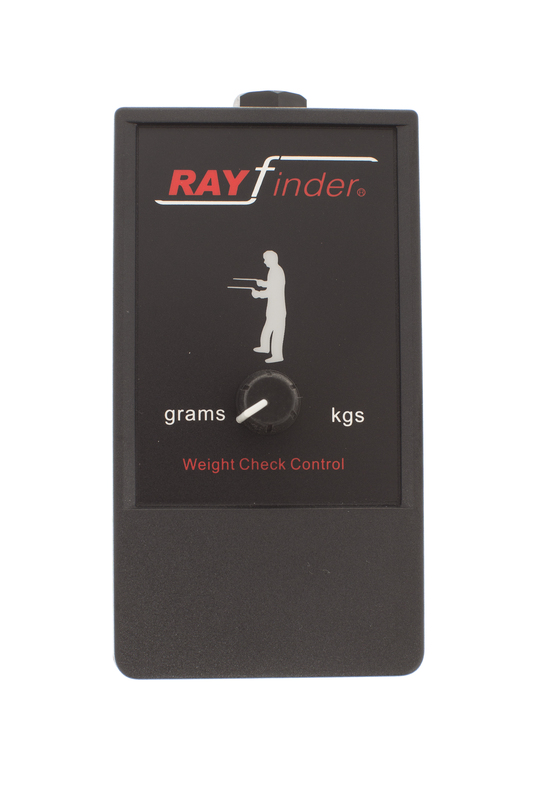 RAYFINDER ground filters: Before starting the scan, RAYFINDER long range locator senses ground minerals and wetness by displaying GROUND ID numbers. Long range locators of competitors are not smart enough, will either loose depth or give false signals on bad ground. 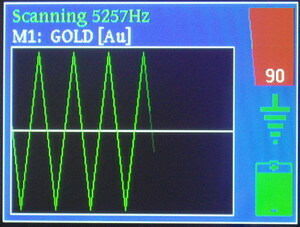 RAYFINDER automatically alters the signal waveform to maintain good depth and metal discrimination for all ground conditions. 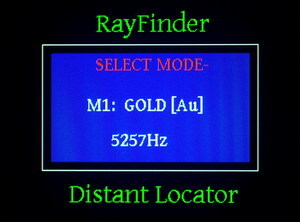 RAYFINDER factory and user programs: Modes for gold, silver, copper, bronze, iron, lead, aluminum, diamonds, water, void & 6 free modes for other elements. 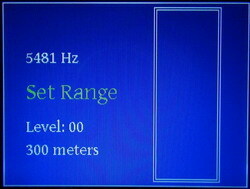 Unlike other LRL devices the metal frequency is not locked, and can be fine adjusted by the user in +/-1 Hz steps. 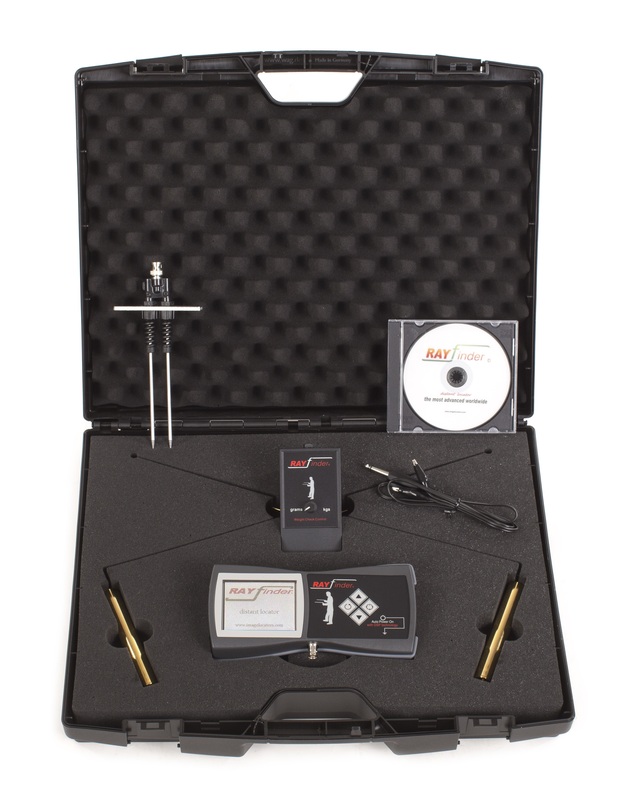 Place your target sample on the ground to scan for its frequency and “teach” RAYFINDER to locate it. 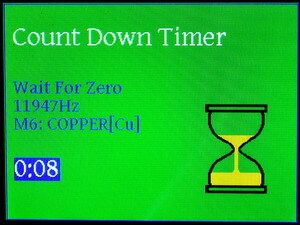 The user frequency settings are stored in memory to be used next time RAYFINDER gold detector powers on. the result appears as GROUND VALUE identification number, on a scale 0 to 999. 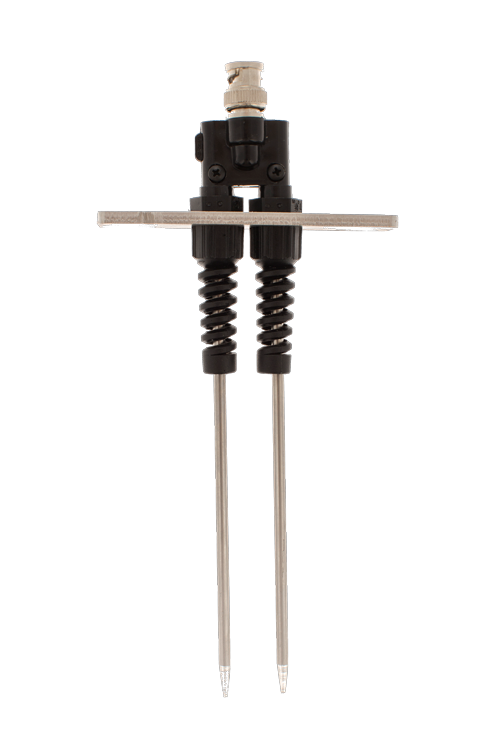 Long range locators from competitors are simple frequency generators, with locked metal frequencies and not any ability to sense ground conditions. Those frequency generators are not specialized for ground usage, they might operate well in soil with average minerals, but do not penetrate on neutral grounds. Even worse in heavy mineralized soil will give false target signals. 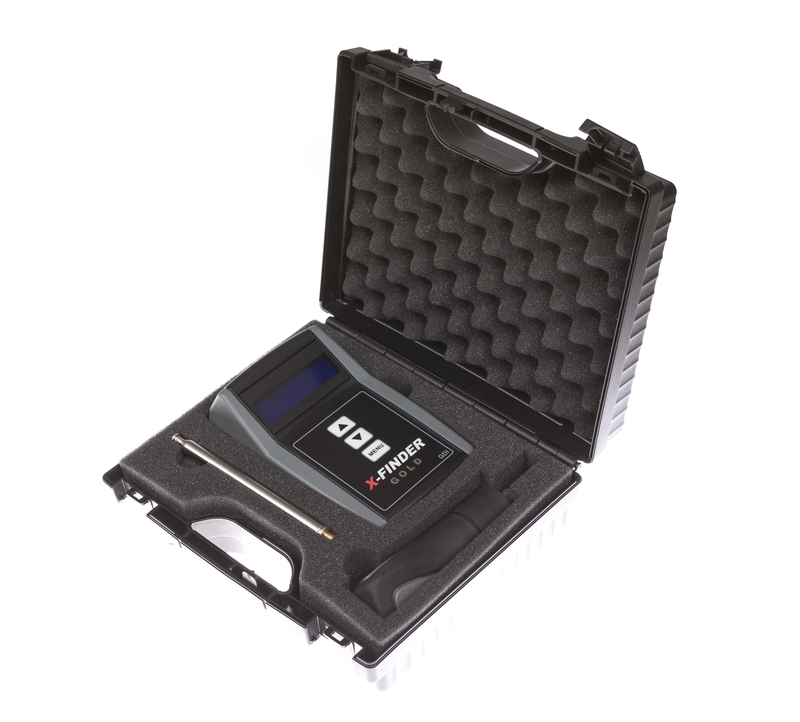 The DGB – Digital Ground Balancing feature, programmed in RAYFINDER long range locator to assist the reliable target indication, and maintain maximum range and stable operation regardless of the ground type. As a second step, the “RAY track” system, completes the ground balancing accurately, by selecting variable waveforms of the transmit frequency to match the various soils. 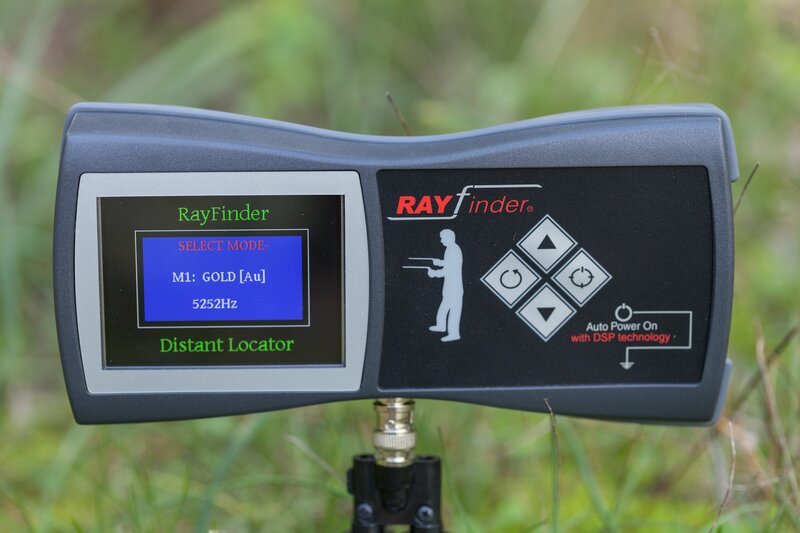 RAYFINDER gold detector long range locator features a worldwide cutting edge technology invention. 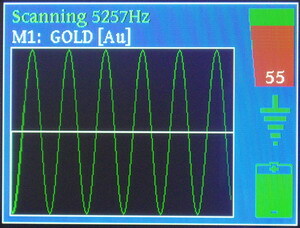 Select the frequency for gold or other modes. 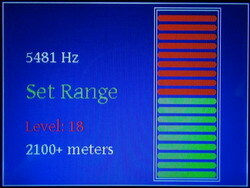 The frequencies are not locked, and can be adjusted using the arrow keys for accuracy. When the charging of the signal to the ground completes the RAYFINDER electromagnetic field is strong enough, and the message START SCANNING alerts to pinpoint the target. All other metal objects in the area are eliminated, and the desired element absorbed enough energy from RAYFINDER to become visible. 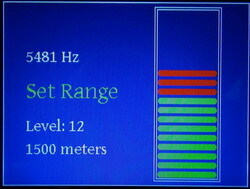 The range levels can be set by the user. Examples of different detection distances. 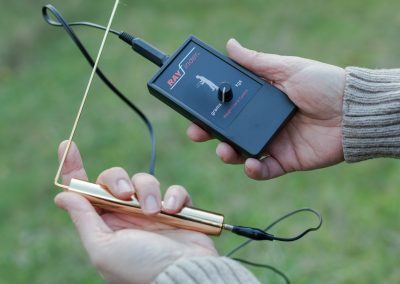 RAYFINDER gold detector senses mineralization and selects the suitable signal pulse for the ground to filter false targets. Ensures excellent operation to all soil conditions. The L rods are powered by the amplifier module, they are 45 cm long and gold plated, this way do not suffer oxidation by contacting with the human skin PH. The purpose of the L rods is to indicate the user that he has crossed the energy line between the RAYFINDER probe and the target. This unit’s purpose is to power the antenna rods. This way the system is not self-potential. Power module contains a 9V DC battery for a power supply. By increasing user conductivity, the power module permits everyone to be a successful user. 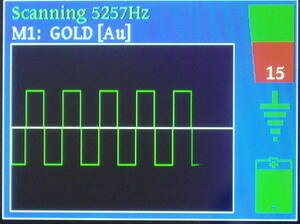 The power module can determine a target’s weight after a target signal line has been verified. The weight check is controlled by a rotary knob on the power module. Set low amplification and only large quantities in kilograms are located. Select high amplification and smaller quantities corresponding to grammars also are realized. All the elements of nature produce a phenomenon called “resonance”. One classic example to that phenomenon is that of a clear, loud and high frequency sound that can break glass. If the physical frequency of glass is similar to the playing note, then the glass will start to tune to these vibration pulses. 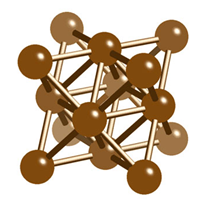 If the vibration becomes very intense for the crystals structure, it will break. Resonance occurs when an element absorbs energy same to its physical frequency. Somme people can see this energy field with the naked eye like in the case of human aura. Many years have been spent experimenting with various LRL devices to develop this small, but powerful RAYFINDER transmitter capable of transmitting Radio Frequency (RF) signals accurate to 0,1Hz stability, enough to stimulate only the desired elements. That accuracy in signal stability is produced by a technologically advanced DSP microchip running at 40 MIPS inside the RAYFINDER. 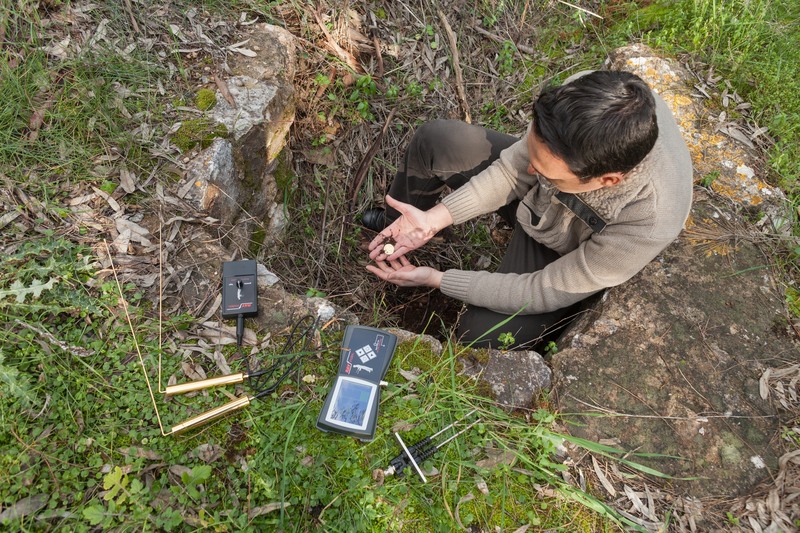 Signal is channeled through the soil over a considerable distance at varying waveforms that filter out the interference caused by the soil minerals. The emitted signal is induced into the soil in a directional pattern of 360°. And because of that induced signal the targets become “visible”. 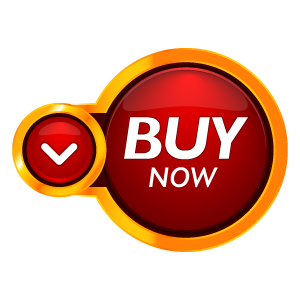 Targets can be located to all directions, and the user is not limited to search from a specific direction. Now that the signal is transmitted from the RAYFINDER long distance locator, the expected target responds with a solid and identical signal. 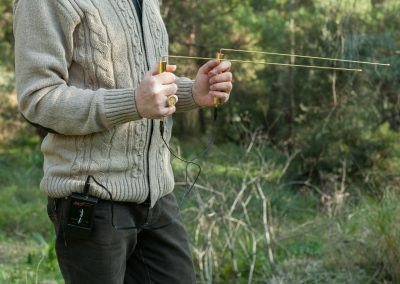 This solid signal can be traced by the operator using antenna L rods, and therefore all non-desirable targets are eliminated. 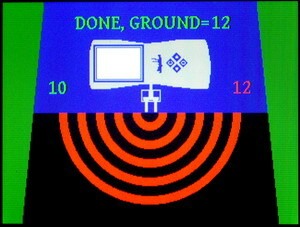 That signal between the RAYFINDER long range locator and the target becomes “a path” for the operator to trace the target. 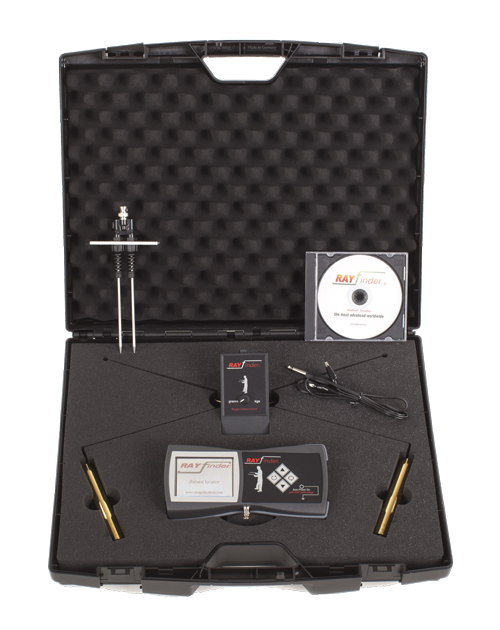 The whole procedure lasts few minutes to realize if there are any specific targets within the location range of the RAYFINDER long range locator. 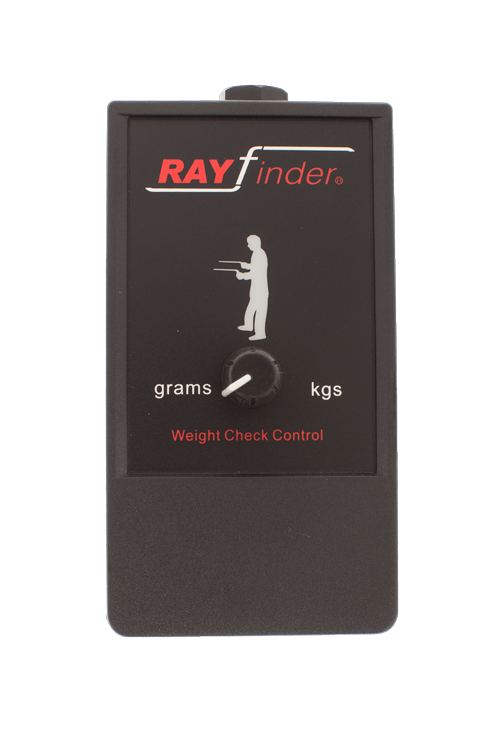 Range of the RAYFINDER can vary for many reasons. The first and most important variable is size of target. The larger the target the range is extended. That is followed by soil conditions (presence of electrolytes) and length of time in the ground. Another factor that enhances the operational performance of the RAYFINDER, is the chemical change of the soil immediately surrounding the target. Those targets that have a tendency to oxidize, whether it be the object itself or its container, will present a stronger signal. Because of that oxidation factor, the target will offer a stronger potential for amplifying the RAYFINDER transmitted signal, therefore an object that is buried for a long time in the ground absorbs the signal in a larger percentage than a freshly buried. 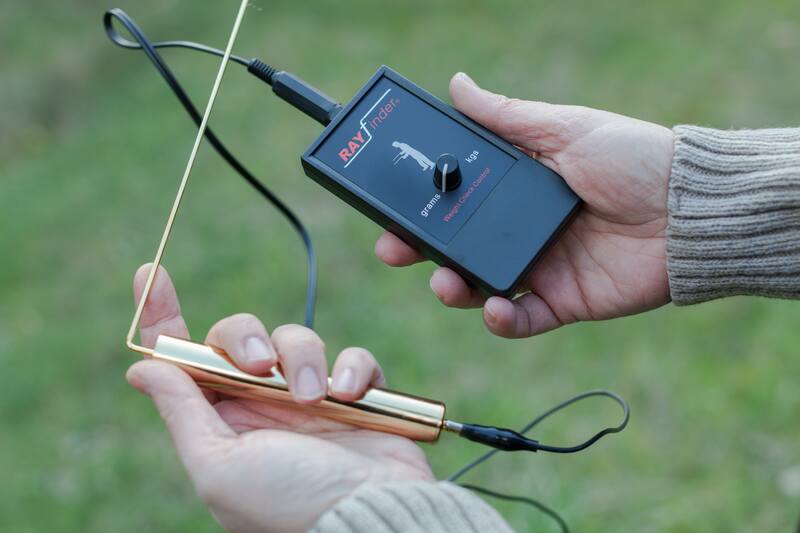 ARE YOU INTERESTED FOR rayfinder gold detector long range locator? carry case with foam inserts.